The Long Center presents Cirque Éloize: Saloon, March 29 – 30 in Dell Hall. America is expanding. The railroad is stretching westward to lands of untold promise. In the middle of the desert, a town comes to life. The Saloon doors swing open to reveal a motley cast of individuals, each with a tale to tell. In Cirque Éloize’s Saloon, the infectious energy of folk music and strains of fiddle set the tone for an acrobatic comedy that sweeps spectators away in a mad flurry. Under the spell of Saloon‘s beautiful Belle, the lover sets off a chase worthy of the greatest Westerns. 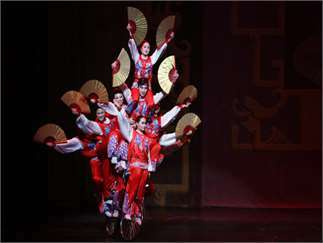 Unfolds a series of unusual events mixing acrobatic prowess and inventive choreography. The lovebirds on the run wreak havoc wherever they go, from the deserted plains to the depths of the mine, until the final acrobatic duel. Swing open the Saloon doors and enter a mythical world created by live music and the exhilarating pace of spectacular performances. Let yourself get swept away by enthralling voices, magical harmonies and live instrumentation. The timeless tunes of Johnny Cash and Patsy Cline set the traditional, epic scene for a fast-paced show with no shortage of audience thrills. Over the past 24 years, Cirque Éloize has travelled te planet with its 11 shows and hundres of special events. Some three million people in fifty countries have been charmed by the originality, intimacy, energy and poetry of its creations. From the Magdalen Islands, “éloize” is an Acadian word meaning “heat lightning.” It captures the essence of Cirque Éloize: heat and energy.